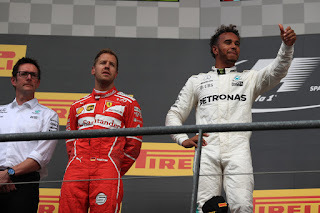 Talking about F1: The F1 blog: Italian GP Betting Preview - Flutter on Ferrari? On one level the Belgian Grand Prix last weekend went as expected, with a Lewis Hamilton pole and win. But on a broader level, expectations shifted. just like he did at Spa? Mercedes was supposed to dominate at Spa but instead Sebastian Vettel and Ferrari chased Lewis all the way and looked quicker in race trim. Now at Monza this weekend we have another track with similar (ish) high speed demands, plus Ferrari is at home where it historically finds extra oomph. The chat is of a new engine debuted this time. On the other hand a heavier restriction on oil burning is also coming in this weekend. It was thought anyway that it'd impede Ferrari more than Mercedes and yesterday we learnt furthermore that Merc's new engine - debuted last weekend - won't be subject to the stricter limit. Still if it's too close to call then Seb's 18/5 to win is better value than Lewis's 2/3. It's still worth backing Lewis for pole - where Mercedes can turn its engines up more than Ferrari- at 8/13. Given both Ferrari and Merc will likely be backing their 'number one' pilot it's likely not worth backing anyone else to triumph. Yet if Spa indeed gives Ferrari more general encouragement then it may be the right time to exploit the 2/1 available on Seb to claim this year's world championship. While if as in Spa Lewis is likely to get pole but Seb is quicker in the race - and in Monza overtaking will be tough and strategy options likely limited - then the 21/20 for a winning margin of under five seconds is worth your while. It may be smart to back those with Mercedes power are at ultra-fast Monza. Both Sergio Perez and Esteban Ocon can be backed at 2/1 to finish in the top six (Max Verstappen is due to get a grid penalty too, clearing out one 'usual' top six slot). Felipe Massa also looks pretty safe at 4/5 to get in the points; Lance Stroll at 17/11 is more of a punt to do the same. Nico Hulkenberg meanwhile is available at a tempting 5/2 to repeat his Spa top six finish. As for the rest, Jolyon Palmer looked to have turned the corner in Spa and was the lead Renault - i.e. faster than Hulkenberg - until his gearbox broke late in qualifying. He can be backed at 5/2 to score this weekend. Romain Grosjean looks good value at 6/5 to do the same. All odds quoted in this article were accurate on the Oddschecker website at 2130 GMT on Wednesday 30 August 2017.